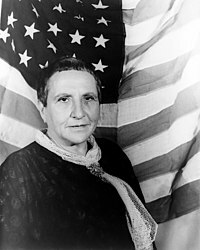 Gertrude Stein (February 3, 1874 – July 27, 1946) was an American novelist, poet, playwright, and art collector. Born in the Allegheny West neighborhood of Pittsburgh, Pennsylvania, and raised in Oakland, California, Stein moved to Paris in 1903, and made France her home for the remainder of her life. She hosted a Paris salon, where the leading figures of modernism in literature and art, such as Pablo Picasso, Ernest Hemingway, F. Scott Fitzgerald, Sinclair Lewis, Ezra Pound, and Henri Matisse, would meet. Honesty is a selfish virtue. Yes I am honest enough.